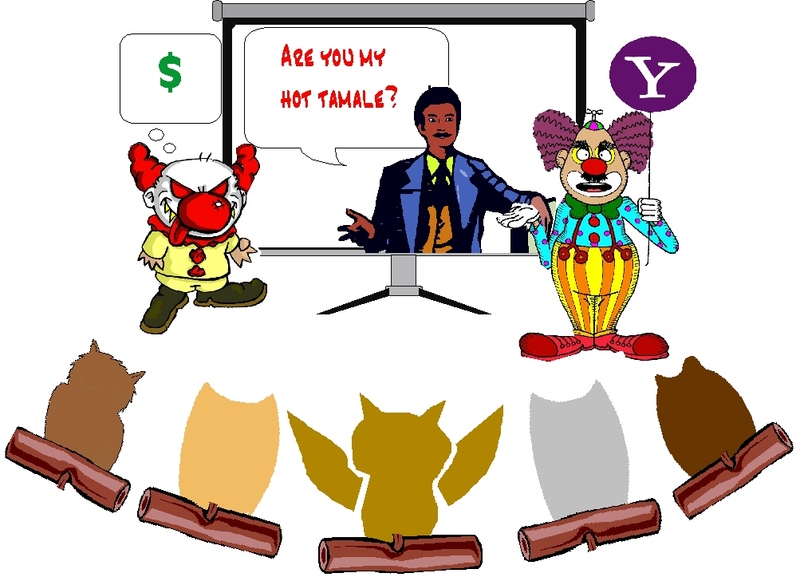 My Yahoo Dream | YAHOO USERS CRUSADE HEADQUARTERS! This was posted by one of the members of my support group. She gave me permission to share it with you, and wherever it might help, such as the blog. Took me awhile to edit out all the junk characters, so I hope Yahoo doesn’t put them back in. The woman wept more inconsolably as the roster of available studs flashed across the wall; the yahoo clowns were totally oblivious to the woman’s emotional distress. Next the large screen advertised a product to visibly reduce the signs of aging on the weeping woman’s face so that she could make herself more appealing to Troy and Enrico, while at the same time she helped generate more targeted advertising dollars for yahoo. This was truly a win-win scenario according to the yahoo intrusion team. While the ads were flashing on the wall, and we literally were drowned out by them and could not hear each other speak, the yahoo sound system was broadcasting very loud cash register ka-ching! sounds as ad revenue came rolling in and was counted. Figures were flashed up on the wall in bright lights, rather like a Jerry Lewis Telethon. As a couple more brave souls attempted to share their stories in the spirit of our original group, more ads aimed at them and their shares were flashed onto the walls, again drowning them out. After a few more attempts to be there for each other in our group turned out this same way, we silently stood up, joined hands, and exited the room, leaving the clowns from yahoo perplexed as their revenue stream fell to zero. No more ka-chings! could be heard. The silence in the room was deafening. The yahoo clowns flashed confused looks to each other. Was that the way we were going to show our appreciation for the new, enhanced yahoo experience that they had crafted for us? How incredibly apt!! That was FANTASTIC !! Thanks Roxanne for sharing that. You really should be a writer (if you aren’t already). Those in charge at !yahoo are brain dead so they won’t/can’t understand the distress they have/are causing, daily, to Group users. Years of bad dreams because of Yahoo. A year later after Yahoo (then CEO Terry Semel) had targeted one of my groups because a group of trolls attacked us and falsely reported us, I had dreams as well. beach umbrella-type thing that was merely there as a rest-stop or a picnic thing or whatever bizarra purpose it held. I saw two chubby men in work gear. They were sent to work on the poles. Something had gone wrong with them. They were laughing though and not really paying attention to their work. Then I saw a tunnel and I followed it down until it rose up onto some foothills. There was a resturant, busy with people. I saw the moon outside the windows and while everyone else didn’t notice it at first, it was as if the moon was so close to earth that every light, electric device controlled by some horded power supply somewhere was being drained and the poles crashed down. I went outside and crossed a bridge while everyone now stared at the moon in awe. There was snow and frost on the ground. The two chubby men were lost but remained slave-driven to the poles and whoever owned them. Then I shook my head and thought it reminded me of Joe Vs The Volcano in that one scene. I woke up and made a note to remember this dream…I posted it here. In 2004 a month or two after the horrible event of what happened with our group being targeted by trolls, I was still haunted by Yahoo’s tyranny and evil deeds. I dreamt that me and several other family members were going into some back room at some large place in a building and for some reason I had my shoes in that room. I don’t know why it’s just that when I came to that point in the dream, I was looking to put on my shoes and go. I really don’t know why I had taken my shoes off. Maybe to feel comfortable? But there was a hostile man telling me and my family that we could not go in that room. And he said that I wasn’t going to get my shoes as he was getting ready to slam the door. But in the dream the door was heavy and large, like a vault door and as he stepped inside the room to lock us out. The door was faster than he was and it caught his face in it. Not his whole head, but his face and while we could not see his body fall limp on the other side of the door, we saw enough of the gruesome remains of his face on the outer crack of the door and the wall. There were other parts of the dream as dreams go. Going around, different places, strange things but this part was the most vivid. When I recounted the dream to my mom she said that was a sign that Yahoo would “lose face”…this was in 2004. Yahoo has inflicted Neo on its users. Some are working to get Yahoo to roll it back. Others are trying to help Yahoo make it as usable as possible. For more information on where to go if you decide to leave Yahoo Groups, look at the Groups Alternatives Page. For some Yahoo Mail alternatives, look at these Alternative Mail Providers. For an index of all posts, go to the Index. How can you protest changes? Look here for some other Useful URLs. Look here for additional information for the disabled and the elderly. What Yahoo Was…And Could Be Again — GREAT! Rescue Ship on the Horizon!